A meeting with the highest institutional and political personalities, of great importance for the future of Bari’s connections and for Puglia. 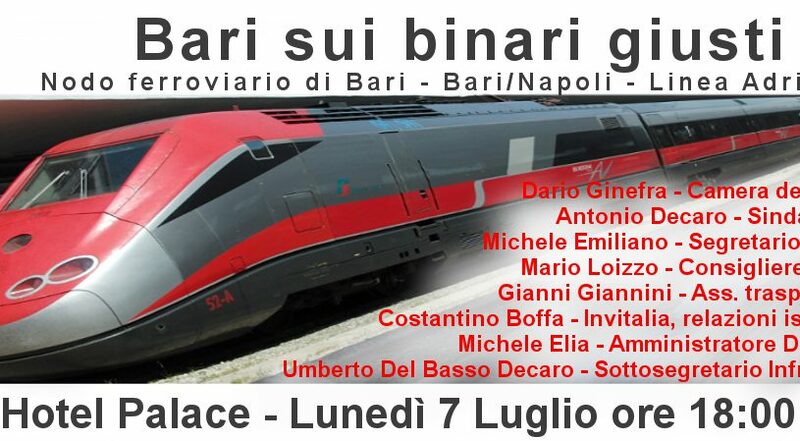 The conference “Bari on track – the future of the railway junction, of the Bari-Naples, of the Adriatic axis” focuses in fact on the projects of the railway junction, the Bari-Naples high-speed railway and the doubling of the Adriatic railway. These are strategic for the economic and social development of our area. You are all invited to Bari’s Palace Hotel this evening ‪at 6 pm.